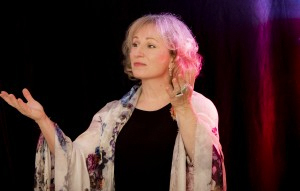 I truly love telling traditional stories and am delighted to find new and interesting environments where storytelling can be enjoyed and add its own special magic. 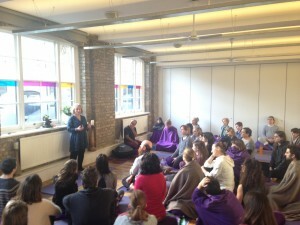 In the picture (below left) I’m telling stories at a yoga centre in London called Triyoga. This is an annual four day ‘Urban Retreat’ at which for the past two years I have told stories to explore the themes of the retreat. Last year the theme was ‘The Four Aims of Life’ as described in the Mahabharata, namely, Wealth, Duty, Love and Surrender. This year it was based on a quote from writer Allan Watts on ‘The indefinable something which is everything.’ If you open a discussion with a story it goes somewhere far deeper and more interesting than you could have imagined. North London Traditional Storytelling Circle is a monthly group for anyone who wants to tell traditional stories (Myths, folk tales, fairy tales, legends) We meet in NW2 on the second Thursday of the month from 7 – 9pm.